Felicity Defined: Elephants and Birds and Babies - Oh My! I had the pleasure of creating baby shower invitations for one of my dearest and oldest friends, Dodie. She is having twin boys! Her mother-in-law asked me to design an invitation to reflect the nursery theme that Dodie has chosen - navy, gray and white, chevron pattern and elephants. Adorable! Before I begin designing any baby shower invitation, I always consult the couples' baby registries first. I look at the bedding chosen, the colors and patterns and evaluate the overall look and feel of the items on the registries. In this case, the below Pottery Barn Kids bedding along with the chevron patterned sheets chosen by the parents were my inspiration. 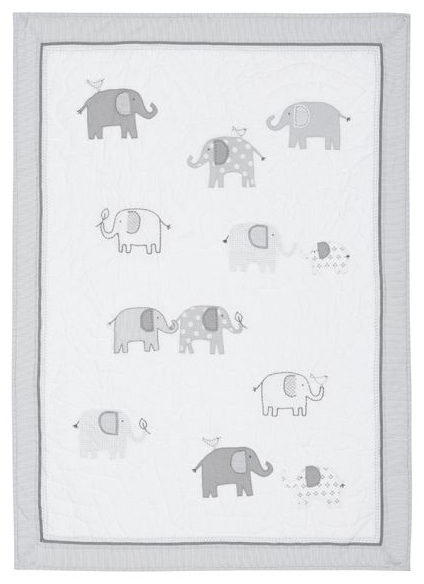 I was immediately drawn to the elephants ... it is a baby inspired design concept but the gray and white color scheme adds a touch of sophistication. The navy and white chevron sheets chosen add a contemporary element to create an overall modern, yet baby-friendly design. ﻿My mind immediately ran wild with design ideas! After many drafts and concepts - I couldn't help but design over 10 options - my friend's mother-in-law selected the below design for the baby shower invitation. I chose to go with a deep navy background and drew a mama elephant and two baby twin elephants. I added the yellow birds as a pop of color - again, a mama bird and two twin baby birds. The elephants and birds were drawn with a nod to the critters on the bedding. I searched furiously for chevron ribbon to represent the chevron design in the babies' sheets and FINALLY found this gray and white ribbon at Hobby Lobby. I also incorporated a cute little statement "There's two to kiss and two to hug and best of all there's two to love". The inside of the invitation stated all of the details of the shower. I have to say, these invitations turned out pretty freakin' cute! An invitation is always more personal when created with love for an individual, and in this case, for a very deserving couple who will undoubtedly make the most wonderful parents to these two little twins! This is a one-of-a-kind design inspired by the top-notch taste of this future mother, and I am thrilled to be able to be a part of the welcoming of these gifts of God to the world. In addition to this shower invitation, I also had the pleasure of creating wall art for the twins' nursery per request of the mother. Dodie had seen some art on Etsy that sparked her interest ... instead of purchasing prints offline, I was able to create one-of-a-kind art, once again, for the nursery using design elements from the above invitations. Does that elephant and bird look familiar? I simply used one elephant and one bird from the invitation and positioned them over a chevron background. I designed the art in Adobe Illustrator - all of the elements are hand drawn by me in the design program. As I said before, the elephant and bird coordinate with the bedding, so this art should add a nice design element to the nursery. The art is 16x20", cut into four 8x10" prints, framed individually in thin, white frames from Michael's. Michael's is the BEST place to buy frames - they have a variety of options to fit any budget, and there is almost always a coupon available. I can't wait to see my art hung over the twins' baby changing table! I am honored to have created these pieces for such an important person in my life and for the two babies that are sure to bless these new parents daily. Congratulations to the future parents - I can't wait to meet the twins! Mel, you are so creative!! When I first saw this post, I got a little excited & thought you might have some news to share ;-) How exciting for you to be able to share your artsy flare for Dodie's upcoming twins. I love the wall art the most!! Beautiful! I love those baby elephants and of course I always love birds!